Do you have stubborn fat under your chin that resists all your efforts to reduce it? Also called a double chin, this problem is often genetic and hard to beat. But a noninvasive, FDA-approved treatment, Kybella®, has an excellent track record. Talk with Dr. Kajal Roy, MD, at Niyan Medspa in Ashburn, Virginia, about this approach. Call Niyan Medspa to schedule a consultation or book an appointment online. Kybella is a product used in injections to reduce the number of fat cells under the skin. It ’s made from deoxycholic acid, a natural substance found in the body. The technical name for this process is injection lipolysis, and it’s a non-surgical approach to a stubborn problem. The FDA has only approved this product for use on the chin. The first step is to numb the area under the chin with a local anesthetic. An ice pack may be used as well to ensure that the area is completely numb. Then Dr. Roy will pre-mark the area that needs treatment. This step is more complicated than it sounds. The marks function as signposts to where the injections will be inserted. Believe it or not, you may receive as many as 50 pokes during one session. Using a carefully calibrated amount of Kybella, Dr. Roy injects the medicine into the chin. Don’t be surprised if it stings as it enters the fat cells. Dr. Roy may give you a head wrap to wear for as long as a month. Although you can resume your normal activities right away, you may want to wait about three days before doing a full-blown workout. You may experience some redness, swelling, or bruising, which typically lasts four to six weeks. If you’re uncomfortable during the recovery period, continue icing the area. Everyone is different, so if your recovery time takes a little longer, don’t be surprised. Most patients need at least two treatments, spaced four to six weeks apart, but others may have as many as six. Dr. Roy will work with you to design a treatment plan that meets your needs. If your chin looks fuller after treatment, it’s because of the swelling. Once the inflammation subsides--in about eight weeks--you’ll start seeing results. Unless you experience a significant weight gain, the treatment should be long-lasting. With Kybella, a double chin is a fixable problem. 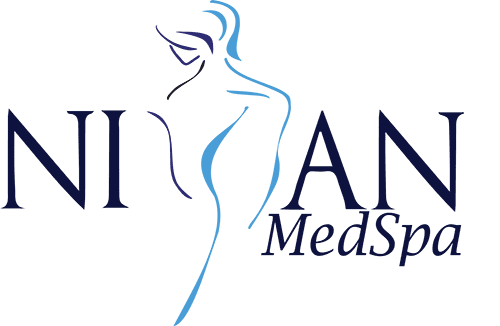 Call Dr. Roy a Niyan Medspa in Ashburn, Virginia, for more information, or book a consultation online.